First of all, don’t try to see Athens in two days. 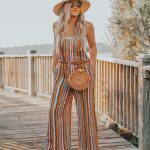 But if you MUST because you’d rather spend more time galavanting around the stunningly beautiful Greek Islands, then this post is for you. When we began organizing our Greece trip last summer, we had originally planned to spend at least four nights in Athens. 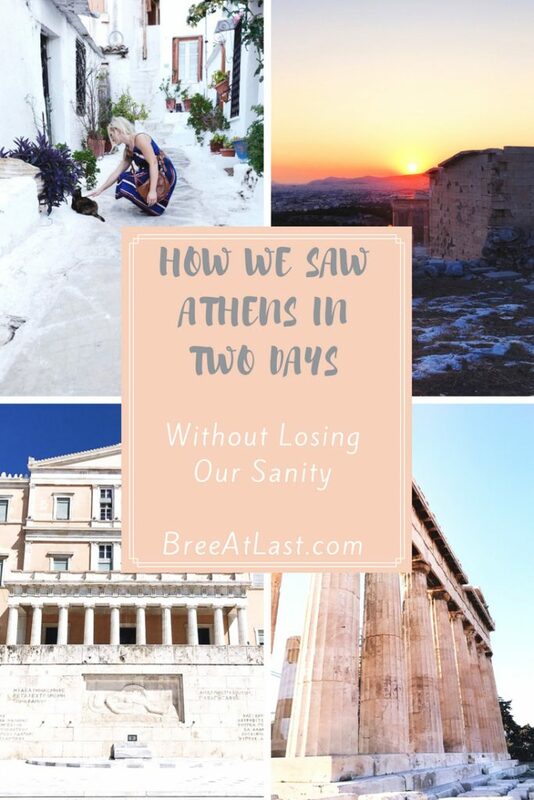 However, we ended up cutting our stay in half after receiving some bad info from a well-traveled, and well-intended friend, who didn’t mince words when they told us Athens was “a dump” and we needed to get in, see the sights, and get the heck out. Ummm…yikes? During our short stay, we were completely baffled at our friend’s assessment and couldn’t have disagreed with it more. To be fair though, at the end of our stay when we were in our taxi at 5am heading to the Piraeus Port to catch a ferry, we definitely saw the “dumpy” part of Athens; but it’s a huge city with a poor economy, so it shouldn’t come as a surprise that there’s a seedy element outside of the tourist zone. Before you leave for Athens, do yourself a huge favor and order this handy little pocket guide that’ll set you back less than $10. 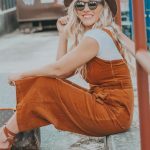 If you’ve had a chance to read my post on planning tips, you know I typically swear by Rick Steves’ guides for time saving tips, and other great info for traveling smart. His Athens guide was no exception. This is the only guide you’ll need to purchase for Athens, and you’ll be glad you did. Unfortunately we found that Rick doesn’t have too much to offer on the Greek Islands, and neither does any other travel guide series, but we’ll further touch on that dilemma in a future post. Now let’s talk about where you should stay. 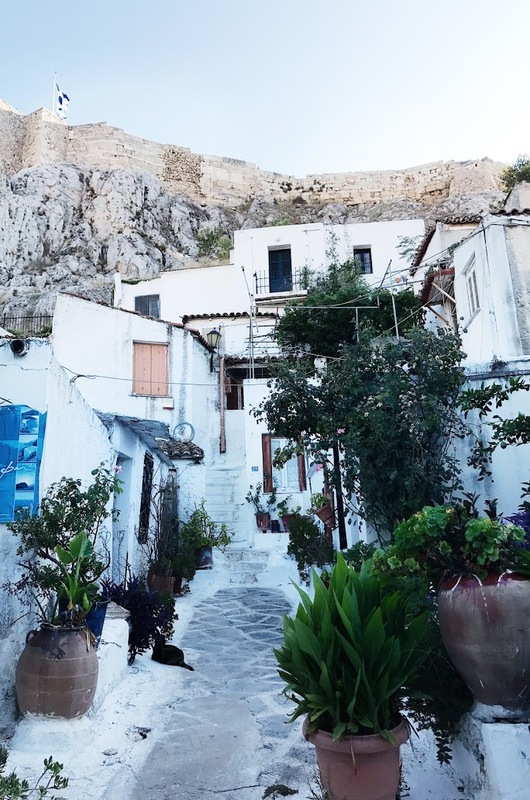 If you’ve done any bit of research on this, you’re probably already familiar with the popular Plaka neighborhood, which overwhelmingly seems to be the best area to hang your hat each night. It’s mostly pedestrian only streets, lined with many shops and restaurants, which makes it a bit touristy, while still maintaining a great deal of charm. 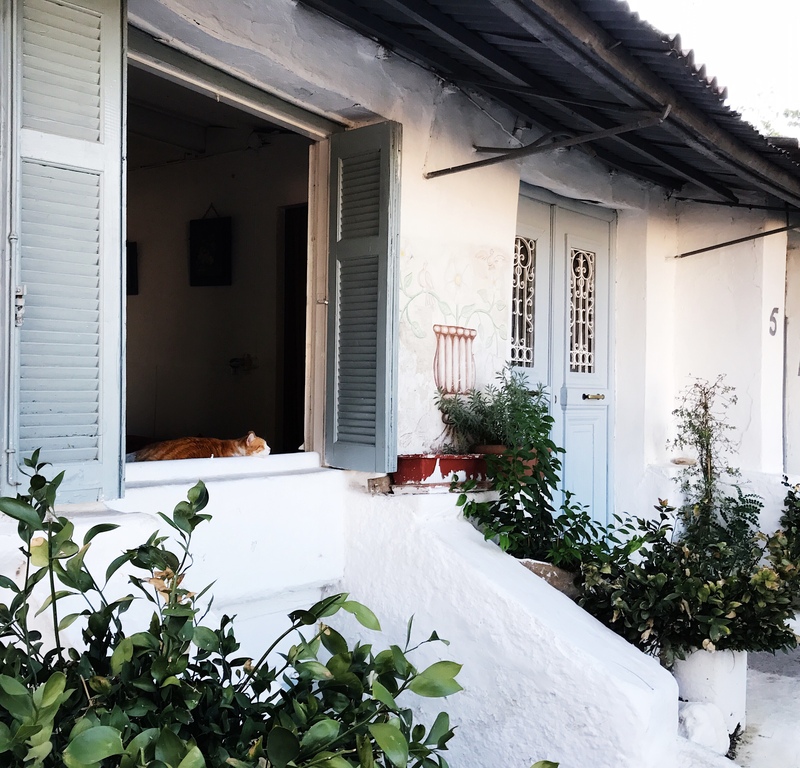 We found this great Airbnb on a quiet pedestrian street named Kodrou in the Plaka neighborhood (get $40 toward your first Airbnb stay by signing up here ). The flat looks 1000x better in person than it does in the pics. The host was so sweet and incredibly helpful with dinner recommendations and any other questions we had. Since we tend to take longer vacations, we always aim to keep our lodging budget under $100 per night, and this flat came in way under budget at $53/night plus a small cleaning fee. And that was during peak season (*GASP*). We slept like rocks because they have blackout shutters and an amazing air conditioner. Plus the bed was extremely comfortable. If my Airbnb recommendation isn’t available during your stay, just try to find any budget friendly place with good reviews inside or near the Plaka area. This is not a place where you want to splurge on lodging, as you really won’t be spending any time there outside of catching some sleep. 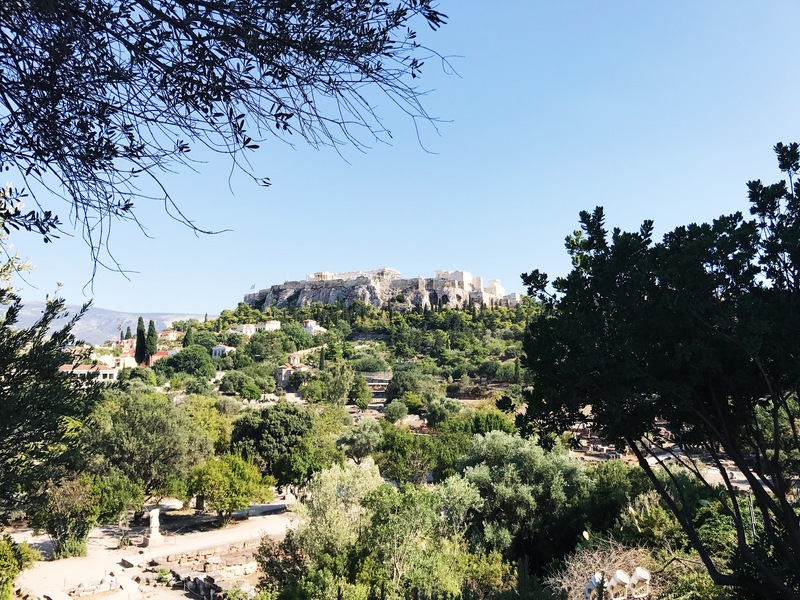 Many hotels will boast about views of The Acropolis, but you can essentially see The Acropolis from nearly everywhere, so don’t spend a premium on this view. Again, you’ll never be at your apartment or hotel to enjoy it. What Can You See in Just Two Days? Surprisingly, you can cover a lot in a short period of time, since pretty much all of Athens’ highlights are within walking distance of the Plaka. Our flight landed in Athens at 10:30am, and we had already coordinated our meet-up with the Airbnb host ahead of time. There’s a pretty good mass transit system to get you from the airport to the Athens City Center, but at the advice of our Airbnb host we opted to take a taxi straight to our Airbnb. It was totally worth the small premium to not have to deal with hauling our suitcases around the metro stations and through the uneven stone streets of Athens to get to our Airbnb. I think the ride only took roughly 30 minutes. The taxi was able to drop us off at the end of Kodrou street where the pedestrian zone begins, and our friendly host was already there waiting upon arrival. 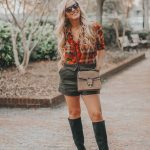 After checking in, we spent about 30 minutes changing clothes and freshening up. While I finished getting ready, Michael began researching cafes and restaurants nearby to grab a bite. 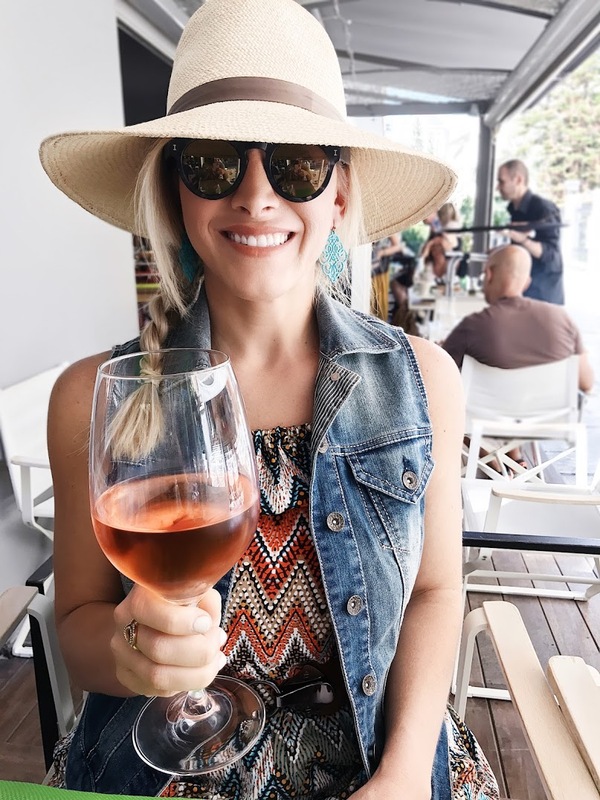 We found this charming wine bar called By the Glass, and headed there to take a deep breath, get our bearings, and most importantly…start enjoying our long overdue vacay while also enjoying some delightful wine and food. 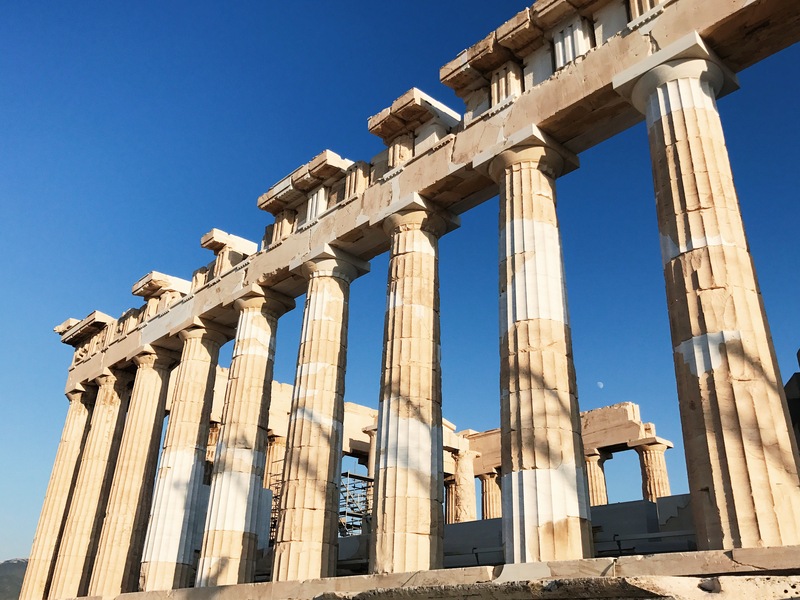 Our plan for our first day was to tackle Rick Steves’ self guided walking tour, and then close the day out atop the Acropolis and enjoy a spectacular sunset, which is what Rick recommends in his book. After finishing our second glass of wine, we headed over to Syntagma Square to get started on the Rick Steves’ self guided walking tour outlined in his Athens Pocket Guide. It really is a great overview of the city. We walked at a leisurely pace, and made several stops to snap photos of the beautiful sights along the way. 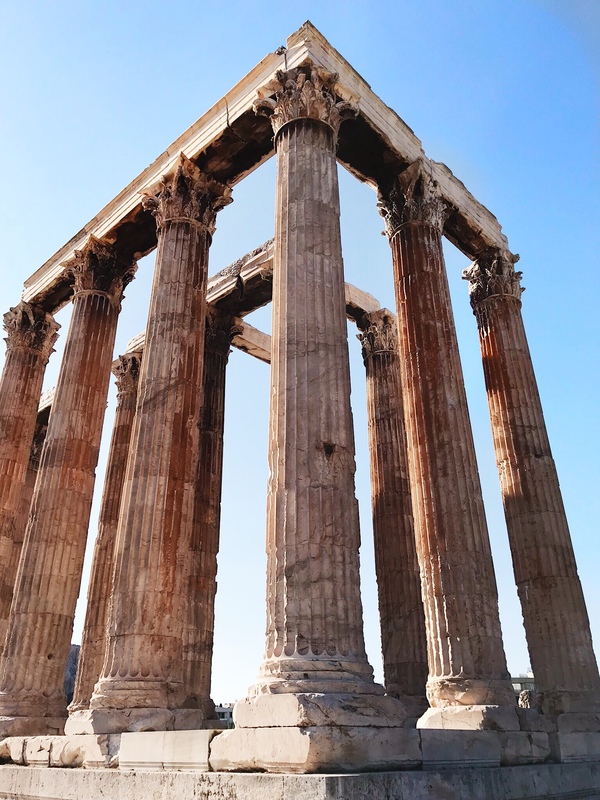 By late afternoon after covering a ton of ground and seeing some breathtaking sights, we had made our way to the Temple of Zeus ruins, which are also featured in Rick Steves’ walking tour. 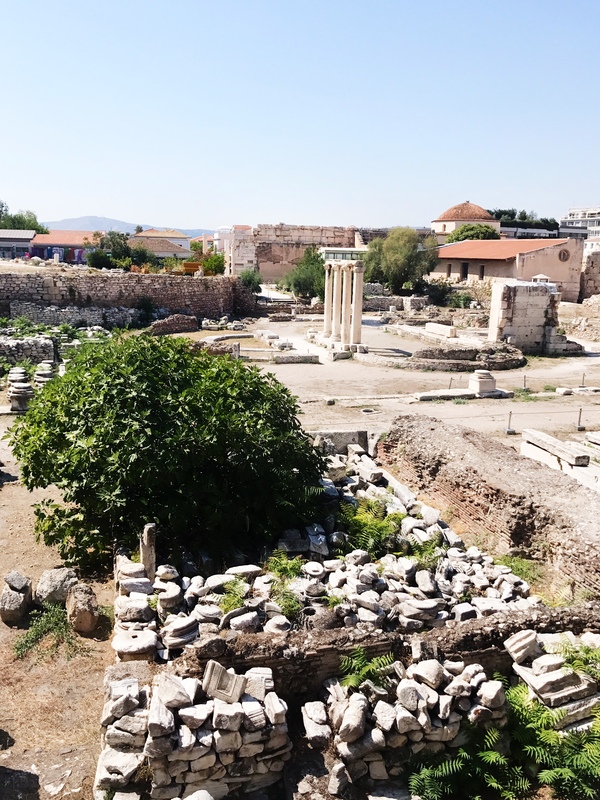 While the ruins are large and impressive here, the key to this stop is purchasing the 30 euro Acropolis Combo Ticket, as the wait is much shorter here than at the Acropolis. 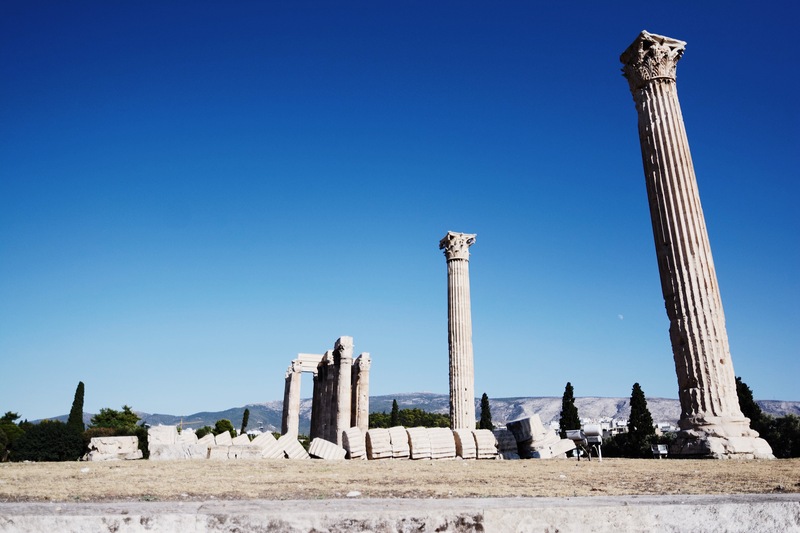 The Acropolis ticket alone costs 20 euro, so the extra 10 euros for the combo ticket is more than made up for with a visit to the Temple of Zeus, and one other ancient sight, such as the Ancient Greek Agora. And the ticket is good for 5 days. 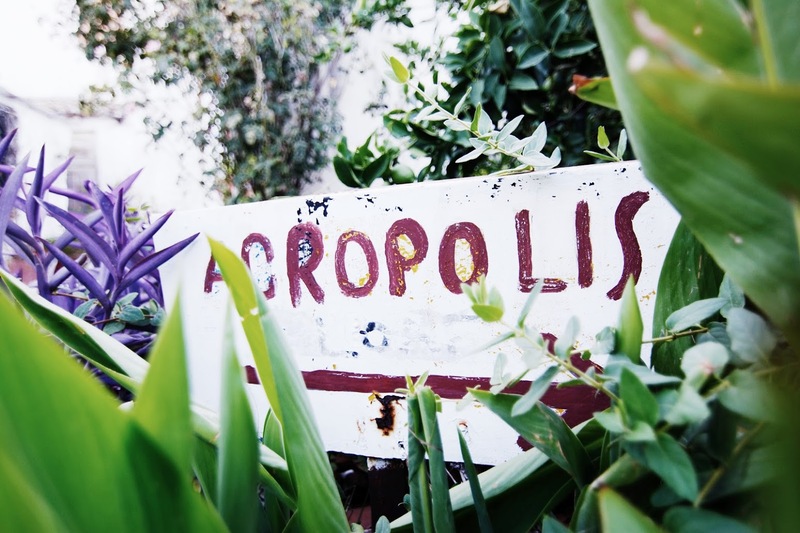 Following the Tempe of Zeus, our plan was to wander up to the Acropolis through the picture perfect Anafiotika Village. 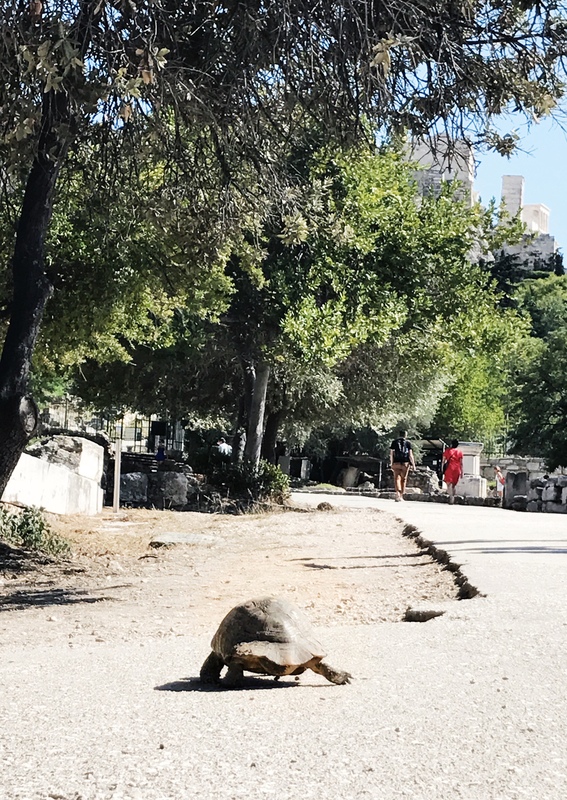 We weren’t sure if Michael’s back would hold up long enough to make it all the way up to the Acropolis with sufficient time to explore before they started booting people out, but figured we’d try. 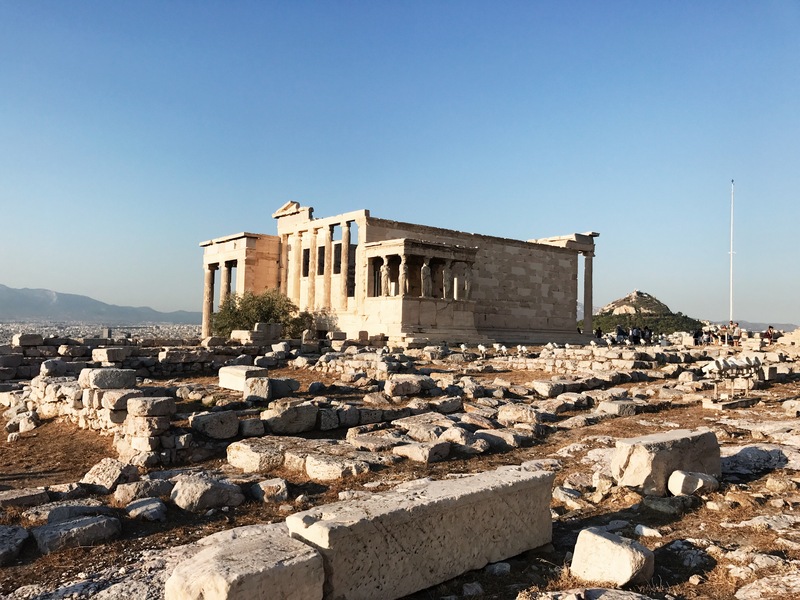 Had he not been in terrible pain, our original loose itinerary would have worked out perfectly, leaving sufficient time on our second day to see the remaining ruins on our to-do list, the Acropolis Museum, and the National Archaeological Museum. Unfortunately, we didn’t make it all the way up to the Acropolis, so we instead took our sweet time getting lost in the maze of miniature streets in and around Anafiotika Village. Definitely not the worst way to end a day of sightseeing. It was incredibly hot in August, so we of course went back to our AirBnb to freshen up for a fabulous dinner. Oopsies! We actually didn’t plan on that, but combine jet lag, the most comfortable bed ever, amazing air conditioning, and blackout shutters, and we’d basically slipped into comas. Not to mention my poor hubby was relying on strong pain meds to try to tolerate his back pain. 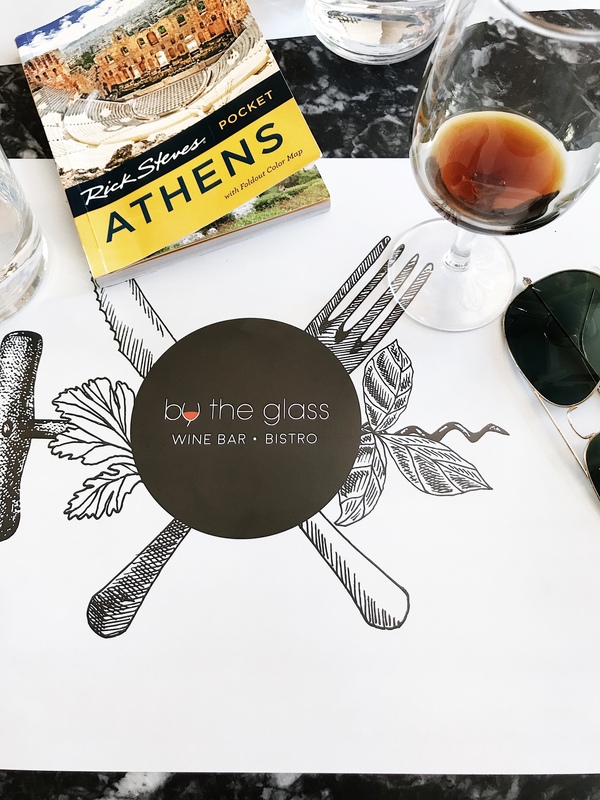 Luckily we rolled out of bed feeling amazingly refreshed and ready to tackle day two of our short stay in Athens….but not until we enjoyed a delightful lunch (for breakfast;)) accompanied by a glass of rosé the size of my head. So this was our first pit stop on our journey up to the Acropolis, but sadly as with many of Greece’s tourist attractions, it was closed purportedly due to a lack of funding. Not a huge deal as far as we were concerned since we could see all the ruins from above, as the modern city level is much higher than the base of the ancient ruins. This sight is more or less something you pass through on the way to the Ancient Greek Agora, and Roman Agora. Notice all of the stacked remnants of the ancient structures awaiting restoration, which is unfortunately where they’ll remain until there’s funding. Just a quick stroll from the Library of Hadrian you’ll find the entrance to the Greek Agora, along busy Adrianou Street. In modern day an “agora” would essentially be the equivalent of the downtown area of the city. These ancient ruins make a terrific prelude to the Acropolis ruins. 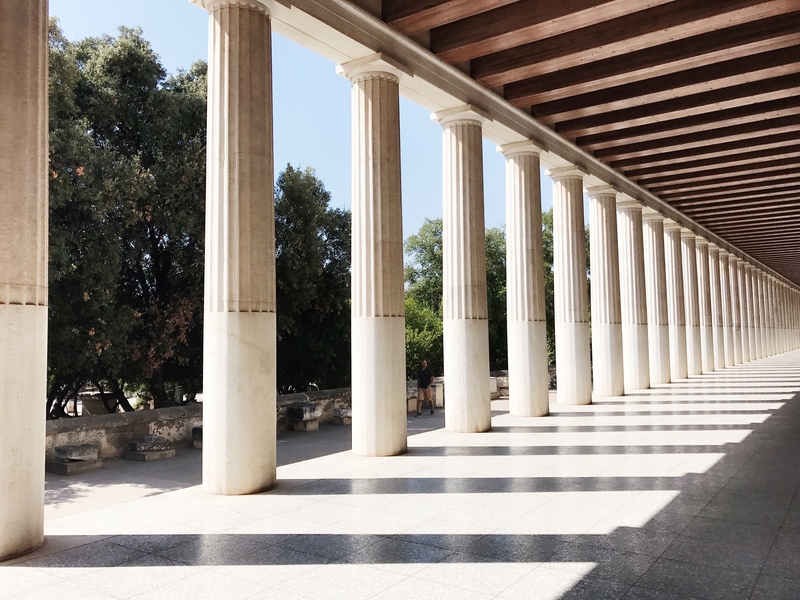 The Greek Agora includes a museum held inside the beautifully reconstructed Stoa of Attalos, which holds a relatively small, but fascinating collection of ancient artifacts. This is also a great place for a restroom pit stop, as finding facilities at these ancient sites can be quite a challenge, if not impossible (meaning sometimes they simply don’t exist). 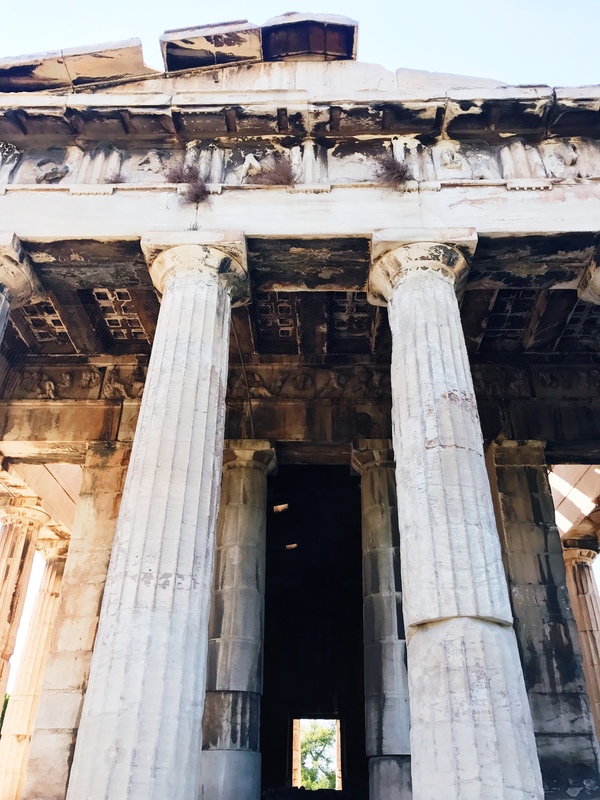 Rick Steves’ Athens Pocket Guide includes a pretty thorough tour of the Greek Agora’s highlights, so we followed his guide and really enjoyed our time there. We had also downloaded his free audio tour, which appeared to be the exact tour read from his book. We started our visit with the audio guide, but once we realized it was the same as the book, we just read from the book because I’m a big talker and prefer to verbally marvel at all the amazingness, which was difficult to achieve walking around with earbuds in. The neighboring Roman Agora is slightly up the hill toward the acropolis, but in following along with the quickly developing theme of our visit, this sight was also closed despite being there within their posted operating hours. The Roman Agora is smaller than the Greek Agora, and we still had the amazing Acropolis to visit, so our feelings weren’t too hurt by this. Plus you can sort of see the ruins from outside the perimeter. If it had been open, I doubt it would have taken us much more than 30 minutes to tour, so we would have still been in good shape time wise. Considering we’d slept till noon, by the time we left the Greek Agora it was well into late afternoon. 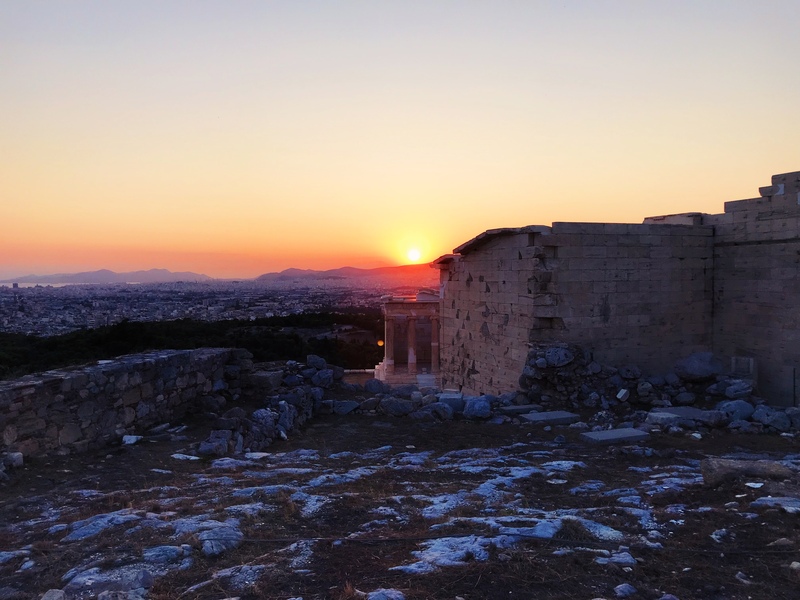 We had already accepted the fact that we weren’t going to make it out to the National Archaeological Museum during our short stay, so our goal at that point was to tour the Acropolis, witness the sun set over Athens from high above the city, then head over to the Acropolis Museum. We lucked out that it was Friday, and the Acropolis museum is open until 10pm on Fridays, so we knew we had plenty of time to take a bazillion photos of the Acropolis Ruins and enjoy the sunset. And the sunset definitely did not disappoint. By now we were also pretty hungry, but thankfully there’s a pretty decent food stand near the entrance of the Acropolis, so before heading in we grabbed some drinks and a couple sandwiches to hold us over until we could sit down to a nice dinner. 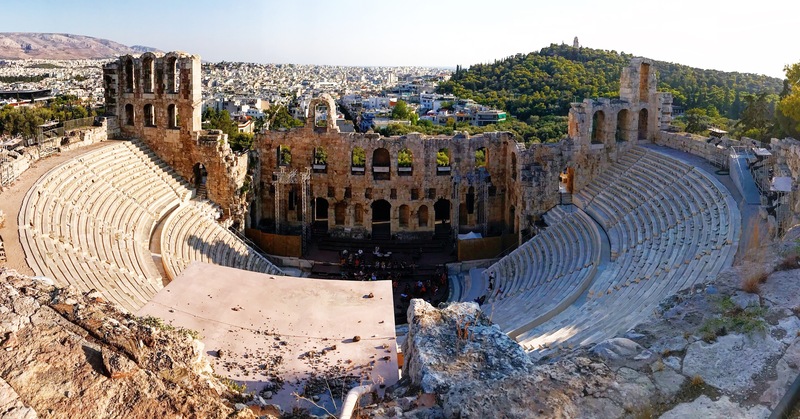 While the Acropolis ruins and the sunset were absolutely stunning, the highlight of our visit to was definitely being treated to this surprise concert during rehearsals at the Ancient Odeon of Herodes Atticus just down below. It was truly a moving experience hearing classical music beautifully erupting out of the open air amphitheater. I couldn’t help but get chills imagining all that had taken place over the last several thousand years at the very sight I was standing. Simply mind-blowing. Our revised plan worked out incredibly well. Thankfully, the crowds lessen at the Acropolis toward the end of the day (as does the intense summer heat! ), so we were also able to get some great shots of the parthenon without hoards of fellow tourists getting in the way. 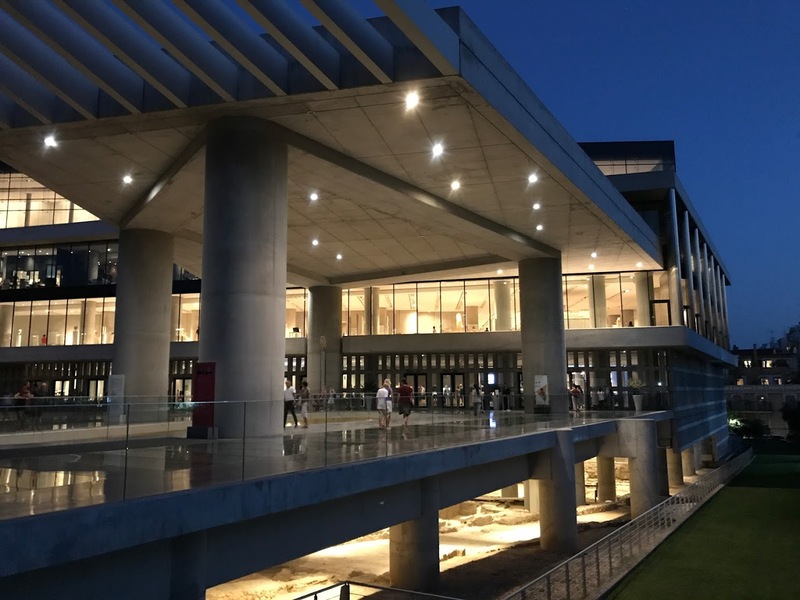 It was dark out by the time we reached the Acropolis Museum on foot, which made entering the building even more spectacular. Even though the museum is extremely modern, it’s been carefully constructed over top of ancient ruins, which are clearly visible from above through the glass walkways around the museum. The ruins are continuously being excavated (as the budget allows), and at night they really shine brightly which adds a whole other cool element to the experience. We were mistakingly under the impression that the Acropolis Museum was included in the combo ticket, but it’s not. No big deal, as tickets are only 5 euros and the museum is totally worth the price of admission. 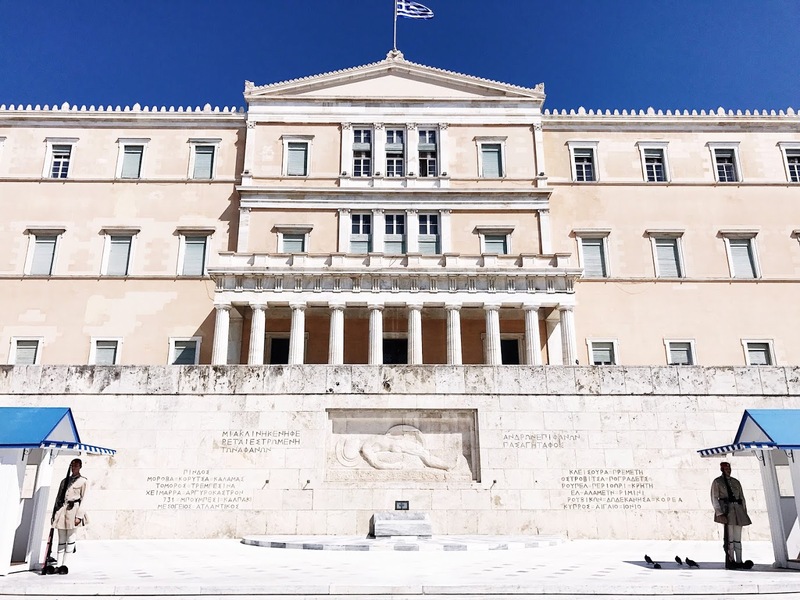 If you’ve ever been to the British Museum where the Lord Elgin Marbles from the Parthenon are proudly on display, you’ll probably find Greece’s take on this situation a little interesting. It’s clear that, in general, Greece is not thrilled that the British Museum still has possession of these ancient marbles, and they essentially view Lord Elgin as a pillaging thief. When you visit the Acropolis Museum, you’ll be able to see a life size reconstruction of the Parthenon’s frieze. According to the Acropolis Museum website, the original frieze was 160 meters in length, and 50 meters of surviving frieze are on display here, while 80 meters of the original frieze are at the British Museum. They’ve somewhat passive aggressively documented each section that is still being displayed at the British Museum (where instead they’ve displayed replicas to fill in the missing pieces), which kind of does make you wish that all of the surviving pieces were in one place. More specifically, the city in which they originated thousands of years ago. We could have spent hours at the Acropolis Museum, but we were probably there for about 1.5 to 2 hours. It didn’t feel like we were there too long, and we definitely took our time wandering about, seeing the highlights, and enjoying the cold air conditioning. At some point though, you’ve seen so many significant historical artifacts around the world, that you simply can’t take it all in. That’s when Rick Steve’s guide comes in really handy, as his tour points you in the right direction toward all of the ‘can’t miss’ highlights. We left the Acropolis Museum feeling pretty satisfied with ourselves because, despite some major set backs (e.g. sleeping until noon, and Michael’s back injury), we had accomplished nearly everything on our original “to do” list, aside from the National Archaeological Museum, and then the two smaller sections of ruins (Roman Agora and Library of Hadrian) due to the unexpected closures. 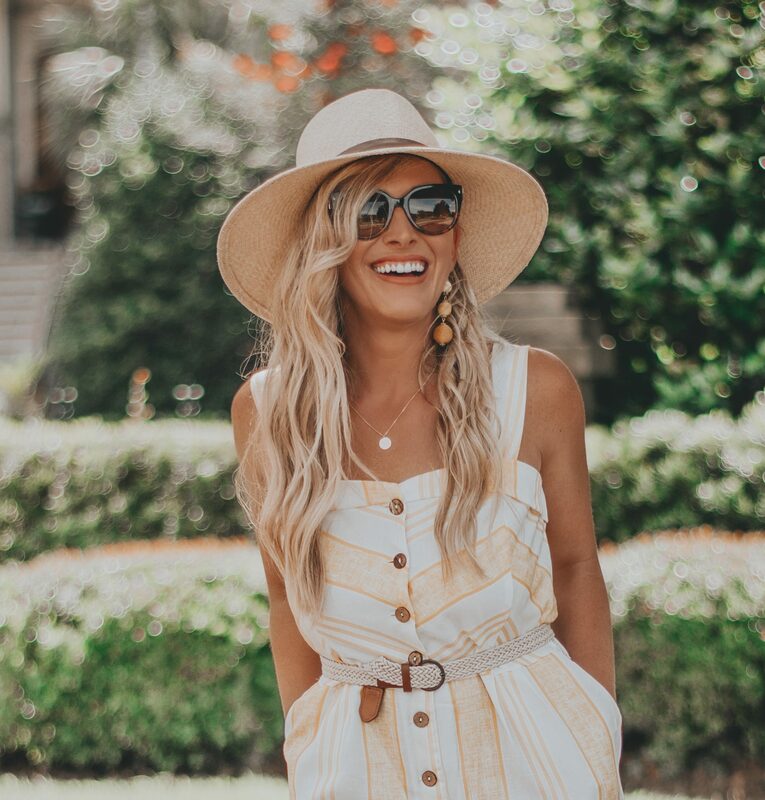 We were ready for some wine and didn’t feel like going back to the apartment to get cleaned up and change….that sort of would’ve been a buzz kill. So instead we found a picturesque restaurant beneath the Acropolis, and settled in for some delectable Greek cuisine. While our time in Athens was short, we really didn’t feel too rushed. 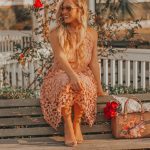 We made it a point to not put too much pressure on ourselves to stay on schedule so that we could truly enjoy each experience. 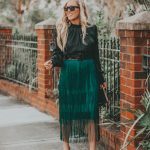 I’ve mentioned my travel philosophy in previous travel posts, but once again, I feel it’s incredibly important to pace yourself when developing an itinerary, because it’s completely okay to leave yourself something new to come back to. Meaning, don’t try to see everything. It’s impossible. Even if it’s wishful thinking, always hope you’ll return again some day.